Passing the GOP tax bill is hard. Selling it to voters may be harder. WASHINGTON — For Democrats, the $1.5 trillion Republican tax bill is the legislative embodiment of everything that's wrong with Donald Trump: a faux-populist, debt-financed, me-first bill that benefits the wealthy at the expense of everyday taxpayers. Democrats think it will contribute to an anti-Trump backlash in next year's midterm elections. And there's little question that it looks like a loser for the GOP right now. Twenty-six percent of voters approve of the bill, while 55 percent disapprove, according to a Quinnipiac poll last week. The bill's cap on certain deductions figures to hit hardest in some of the nation's most competitive Republican-held House districts. And Priorities USA, the leading Democratic super PAC, reports that it saw dips in House incumbents' ratings after voters were shown internet ads about the plan. But, according to Republican and Democratic strategists, the GOP had little choice but to move forward with what could be President Donald Trump's first legislative achievement. "House Republicans were caught between probably losing their majority by passing no bill and possibly losing their majority by passing a bad bill," said former New York Rep. Steve Israel, who was chairman of the Democratic Congressional Campaign Committee for four years. "It's a dangerous midterm calculation when you have to throw a bone to your base that (most) voters are choking on." Republicans say their gamble is a wise parlay: They're betting both that it's better to do something than nothing and that once Americans start feeling the benefits of the tax bill, the numbers will turn around. "I think it will get better if the Republicans hammer their narrative," said former National Republican Congressional Committee Chairman Tom Davis, who represented a Virginia district in the House. "On balance, it's a plus for the Congress because most people will see some reduction in their tax rates." On Sunday, Trump, who could see a personal windfall if the bill becomes law, called it "one of the great gifts to the middle-income people of this country that they've ever gotten for Christmas." 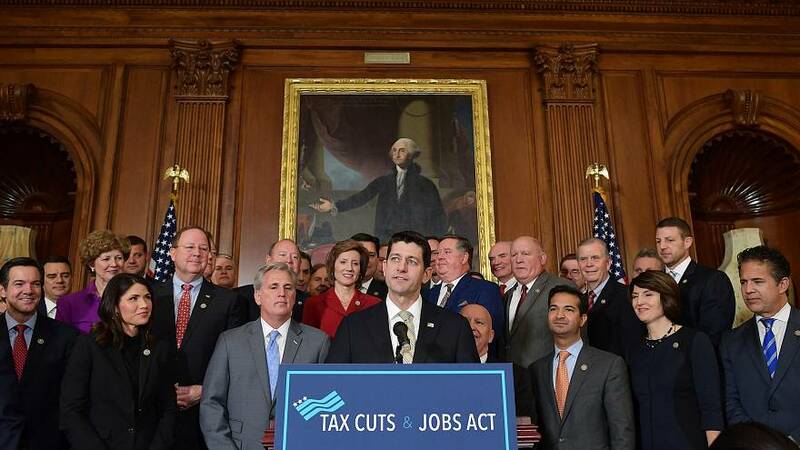 The question for many voters will be whether a relatively small boost in their take-home pay and a possible surge in the economy are worth bigger debt-financed tax cuts for the wealthy and corporations. That has some Republicans worried that Democrats will be able to persuade voters the GOP is helping the rich at the expense of everyone else. "We'd be better off if there were more populist victories in there," Rep. Tom Cole, R-Okla., told CNBC's John Harwood. Kelly Ward, executive director of the National Democratic Redistricting Committee who previously held the same post with the DCCC, said the bill will fire up Democrats and undermine Trump with his base because it's skewed toward the very rich. And, she added, some of the provisions will raise taxes on suburban swing voters. "What you have is a bill that's unpopular with all the right people for Democrats and all the wrong people for Republicans," she said. Democratic candidates will make sure the public is aware of who benefits from the bill's corporate tax cuts, said Maryland Sen. Chris Van Hollen, the chairman of the Democratic Senatorial Campaign Committee. "This is a huge giveaway to foreign stockholders. If you look at U.S. corporations, 35 percent of the stock is held by foreign stockholders," Van Hollen said. "That doesn't sound like 'America First' to me. That doesn't sound like middle-class families first." The real test of the tax cut's political potency will be how it's perceived by voters in swing states and districts across the country next November. Democrats have to pick up 24 seats to win control of the House, and they would have to net two seats in the Senate — in a year in which they are defending 26 seats and Republicans are defending only eight — to take the upper chamber. So far, Democrats have been unified in their opposition to the tax bill, while three Republicans, Reps. Darrell Issa of California, Lee Zeldin of New York and John Faso of New York, have announced they will vote against the measure. "Getting this bill done and getting this bill done right should not have been a binary choice," Zeldin, who is concerned that his constituents will be hurt by a $10,000 cap on the deduction taxpayers can claim for the state and local taxes (SALT) they pay, said in a statement. "Reducing the corporate tax rate to 21 percent, for example, is great, but it should not be done on the backs of any hard-working, middle-income taxpayers," he added. The SALT deduction issue could play prominently in as many as two dozen hotly contested districts in high-tax states such as New York, New Jersey, Pennsylvania, California and Virginia. Republicans will have to explain to voters why they think the tax package is good for the economy and how it benefits individual taxpayers by letting them keep more of the money they've earned, said former NRCC Chairman Tom Reynolds, who represented an upstate New York district in the House. "Some think they can't sell that," Reynolds said. "The Republican Congress and president believe they can." Jesse Hunt, spokesman for the NRCC, said the tax cut will help Republicans present themselves to voters as agents of change against status-quo Democrats, a theme that echoes Trump's 2016 campaign. "Tax reform's going to be a winning issue for us, and we're going to run on it," Hunt said.